In this lesson, we will learn how to find the resultant of two or more couples. 𝐴 𝐵 𝐶 𝐷 is a square with sides of length 28 cm. Two forces of magnitude 117 N act along  𝐴 𝐵 and  𝐶 𝐷 , and two other forces of magnitude of 177 N act along  𝐴 𝐷 and  𝐶 𝐵 as shown in the figure. Find the algebraic measure of the moment of the resultant couple. 𝐴 𝐵 𝐶 𝐷 is a square with a side length of 18 cm, where forces of magnitudes 32 N, 𝐹 N, 32 N, and 𝐹 N are acting along  𝐵 𝐴 ,  𝐵 𝐶 ,  𝐷 𝐶 , and  𝐷 𝐴 , respectively. If the four forces are equivalent to a couple, where the magnitude of its moment is 90 N⋅cm in the direction of 𝐴 𝐷 𝐶 𝐵 , determine the magnitude of 𝐹 .
𝐴 𝐵 𝐶 𝐷 is a square of side length 5 cm, where four forces, measured in newtons, are acting on the sides of the square as shown in the figure. 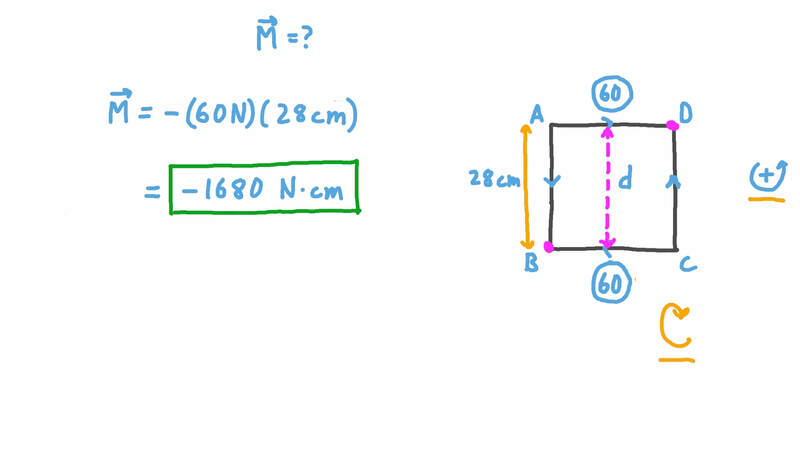 If the system of forces is equivalent to a couple whose magnitude is 65 N⋅cm, determine all the possible values of 𝐹 . Given that the forces in the figure have magnitudes of 56, 105, and 242 newtons, find the algebraic measure of the resultant couple. 𝐴 𝐵 𝐶 is a uniform lamina in the form of an equilateral triangle with side length 35 cm. Forces of 41 N, 28 N, and 61 N act perpendicularly on 𝐴 𝐵 , 𝐵 𝐶 , and 𝐶 𝐴 respectively as shown in the figure. Find the algebraic measure of the moment of the resultant couple. 𝐴 𝐵 𝐶 𝐷 is a parallelogram, in which 𝐴 𝐵 = 1 0 c m , 𝐵 𝐶 = 1 0 c m , and 𝑚 ∠ 𝐴 𝐵 𝐶 = 1 5 0 ∘ . Forces of magnitudes 3, 6, 3, and 6 newtons are acting along  𝐴 𝐵 ,  𝐶 𝐵 ,  𝐶 𝐷 , and  𝐴 𝐷 , respectively. Find the moment of the resulting couple. A light rod, 𝐴 𝐵 , has length 46 cm and midpoint 𝑂 . Two forces measured in newtons and a moment of magnitude 33 N⋅cm act on the rod, perpendicularly to the vertical plane, as shown in the figure. Determine the moment of the resultant couple acting on the rod. 𝐴 𝐵 𝐶 𝐷 is a rectangle, in which 𝐴 𝐵 = 1 4 c m , and 𝐵 𝐶 = 2 4 c m . Given that 𝑋 and 𝑌 are the midpoints of 𝐴 𝐵 and 𝐶 𝐷 , respectively, and forces of magnitudes 153 N, 199 N, 153 N, 199 N, 73 N, and 73 N are acting as shown in the figure, determine the moment of the resultant couple rounded to two decimal places. In a square 𝐴 𝐵 𝐶 𝐷 , whose side length is 3 𝐿 , 𝐹 ∈ 𝐴 𝐵 , 𝐸 ∈ 𝐷 𝐶 and 𝐹 𝐵 = 𝐸 𝐷 = 1 √ 3 𝐿 . Two forces, each of magnitude 143 newtons, are acting along  𝐴 𝐷 and  𝐶 𝐵 . Two other forces, each of magnitude 164 newtons, are acting along  𝐹 𝐶 and  𝐸 𝐴 . Given that the moment of the resultant couple equals 𝑐 𝐿 N⋅cm, determine the value of 𝑐 to the nearest integer. In the given figure, s i n 𝜃 = 4 5 and the algebraic measure of the moment of the resultant couple equals  9 0 − 7 2 0 √ 3  N⋅cm. Given that the forces are given in newtons, find the value of 𝐹 .
𝐴 𝐵 𝐶 𝐷 is a parallelogram in which 𝐴 𝐵 = 2 6 c m , 𝐵 𝐶 = 1 4 c m , and 𝑚 ∠ 𝐴 = 3 0 ∘ . Forces of magnitudes 60 N, 28 N, 60 N, and 28 N are acting along  𝐵 𝐴 ,  𝐵 𝐶 ,  𝐷 𝐶 , and  𝐷 𝐴 respectively to make a system equivalent to a couple. Find the magnitude of each of the two forces perpendicular to 𝐴 𝐷 that would need to act at 𝐴 and 𝐷 in order to make an equivalent system. 𝐴 𝐵 𝐶 𝐷 is a rectangle, where 𝐴 𝐵 = 3 c m and 𝐵 𝐶 = 4 c m . Forces of magnitudes 178, 213, 178, and 2 1 3 newtons are acting along  𝐵 𝐴 ,  𝐵 𝐶 ,  𝐷 𝐶 , and  𝐷 𝐴 respectively. Two forces of the same magnitude 60 N are acting at 𝐴 and 𝐶 in the directions of  𝐵 𝐷 and  𝐷 𝐵 respectively. Determine the magnitudes of two further forces acting at 𝐵 and 𝐷 , perpendicular to 𝐵 𝐷 , for the system to be equivalent to a couple of magnitude 171 N⋅cm whose moment is in the same direction of the moment formed by the two equal forces 60 N and 60 N acting at 𝐴 and 𝐶 . The forces ⃑ 𝐹 1 , ⃑ 𝐹 2 , and ⃑ 𝐹 3 are acting at the points 𝐴 ( 7 , − 5 ) , 𝐵 ( 3 , − 2 ) , and 𝐶 ( − 4 , − 2 ) respectively, where ⃑ 𝐹 = 4 ⃑ 𝑖 + 4 ⃑ 𝑗 1 , ⃑ 𝐹 = − 4 ⃑ 𝑖 − 4 ⃑ 𝑗 2 , and ⃑ 𝐹 = 4 0 ⃑ 𝑖 − 3 0 ⃑ 𝑗 3 . Given that another force ⃑ 𝐹 4 of magnitude 50 N is acting at  𝐴 𝐵 , where the four forces are equivalent to a couple, determine the magnitude of the moment of the couple. 𝐴 𝐵 𝐶 is a lamina in the shape of an isosceles triangle, where 𝐴 𝐵 = 𝐴 𝐶 = 1 3 c m and 𝐵 𝐶 = 1 0 c m . It rotates freely in a vertical plane about a fixed hinge at 𝐴 . A couple with moment of magnitude 67 N⋅cm acts on the lamina to keep it in equilibrium with 𝐴 𝐵 vertical. Find the weight of the lamina given that it acts at the point of intersection of its medians. 𝐴 𝐵 𝐶 is a right-angled triangular lamina, with the right-angle at 𝐵 . Length 𝐴 𝐵 = 2 7 c m , length 𝐵 𝐶 = 2 2 c m , and its weight is 48 N. The lamina’s weight is acting at the point of intersection of its medians (lines drawn from each vertex to the midpoint of the opposite side), and the lamina is suspended from vertex 𝐶 , where its plane is vertical. Determine the magnitude of the moment of the couple that would hold 𝐵 𝐶 in the vertical position. 𝐴 𝐵 𝐶 𝐷 is a rectangle, where 𝐴 𝐵 = 8 c m and 𝐵 𝐶 = 6 c m . If forces of magnitudes 35, 9, 35, and 9 newtons are acting along  𝐵 𝐴 ,  𝐵 𝐶 ,  𝐷 𝐶 , and  𝐷 𝐴 , respectively, determine their moment 𝑀 . Also, for the system to be in equilibrium, another two forces, each of magnitude 𝐹 , are required to act at 𝐴 and 𝐶 , where their lines of action are perpendicular to 𝐴 𝐶 . Determine the value of 𝐹 and the direction of rotation of the formed couple. 𝐴 𝐵 𝐶 is a triangle, where 𝐴 𝐵 = 2 0 c m , 𝐵 𝐶 = 2 5 c m , and 𝐶 𝐴 = 1 5 c m , and forces of magnitudes 120, 150, and 90 newtons are acting along  𝐴 𝐵 ,  𝐵 𝐶 , and  𝐶 𝐴 respectively, where the system is equivalent to a couple. Determine the magnitudes of the two parallel forces that would make the system in equilibrium when acting at 𝐵 and 𝐶 perpendicularly to 𝐵 𝐶 . A lamina in the shape of a square has a side length of 20 cm and a weight of 15 N, which is acting at the point of intersection of its diagonals. The lamina is suspended from a horizontal pin near its vertex 𝐴 such that its plane is vertical, and a couple is acting on the lamina that makes it in equilibrium in a position where 𝐴 𝐶 is inclined to the vertical at an angle of 3 0 ∘ . Determine the magnitude of the moment of the couple. 𝐴 𝐵 𝐶 is a lamina in the form of an equilateral triangle weighing 27 N that is acting at the point of intersection of the medians. The lamina is suspended by a thin horizontal pin passing through a small hole near the vertex 𝐴 , thus the plane is vertical as shown in the figure. Also, a couple of moment 50 N⋅cm is acting on the lamina perpendicularly to its plane. Given that the height of the lamina is 9 cm, find the measure of the acute angle that 𝐴 𝐵 makes with the horizontal when the lamina is in equilibrium rounded to the nearest minute. 𝐴 𝐵 𝐶 𝐷 is a rectangle, where 𝐴 𝐵 = 2 4 c m , and 𝐵 𝐶 = 7 c m . Two forces, each of magnitude 43 N, are acting along  𝐵 𝐴 and  𝐷 𝐶 , respectively. Determine the magnitude of each of the two forces acting at points 𝐵 and 𝐷 and perpendicular to 𝐵 𝐷 that would make the whole system in equilibrium. 𝐴 𝐵 𝐶 𝐷 𝐸 𝑂 is a regular hexagon, where forces of magnitudes 1 2 √ 3 N, 81 N, 1 2 √ 3 N, and 81 N are acting along  𝐴 𝐵 ,  𝐷 𝐵 ,  𝐷 𝐸 , and  𝐴 𝐸 , respectively. If the system is equivalent to a couple, determine the magnitude of each of the two forces acting along  𝐸 𝐵 and  𝐴 𝑂 for the system to be in equilibrium. A rod 𝐴 𝐵 has length 5 cm and weight 6 N, which is acting at its midpoint. It can rotate freely in a vertical plane about a horizontal pin at 𝐶 , where 𝐴 𝐶 = 2 c m . A force of magnitude 6 N is acting at 𝐴 vertically upwards. Determine the magnitude of the force 𝐹 that brings the rod to equilibrium when it acts at 𝐵 perpendicularly to 𝐴 𝐵 . Also find the reaction of the pin 𝑅 when the rod is inclined to the horizontal at an angle of 4 5 ∘ such that 𝐴 is higher than 𝐵 . A uniform rod 𝐴 𝐵 having a length of 85 cm and a weight of 10 N is moving in a vertical plane about a fixed hinge at its end 𝐴 . Given that a couple of moment 130 N⋅cm is acting on the rod and perpendicular to its plane, find the inclination of the rod to the horizontal in the position of equilibrium, rounded to the nearest minute if necessary. In the figure below, 𝐴 𝐵 𝐶 𝐷 is a rectangle in which 𝐴 𝐵 = 5 c m and 𝐵 𝐶 = 4 c m . The forces that are shown in the figure are in newtons, and the system is in equilibrium. Find the value of 𝐹 + 𝐹 1 2 .